Opening up your online DNA results is, ironically, almost like cracking open a fortune cookie. Genetics is something I’ve lived with all my life. My mom was a genetics professor, and my undergraduate degree is in molecular biology. And so I knew that even though I was presented with the “science of myself,” I had to take it with a grain of salt. In addition to our genes, the environment plays a role, too. For example, not being at risk for heart disease is great, but eating foods chockful of saturated fat can kill you eventually. So over a year ago, I had my DNA done. (You know, it’s like getting your nails done. Kidding.) I used two services, 23andMe and National Geographic’s Genographic Project. The former required you to spit in a tube, while the latter asked for a cheek swab. 23andMe yields a more personalized profile of health and ancestry, while the Genographic Project is a research project that aims to map the migratory history of the human race. Both are very affordable; I wouldn’t have done them if they cost several hundred dollars. I was able to get a 23andMe kit for $99 during a Black Friday sale, and a Genographic kit costs $99.95. The results are fascinating and intriguing. Sometimes, I wasn’t sure what they could mean. Will I have a different (or perhaps deeper) sense of identity, now that I have a better idea of ancestry? Will I turn into a hypochondriac if I see that I’m at risk for certain diseases? 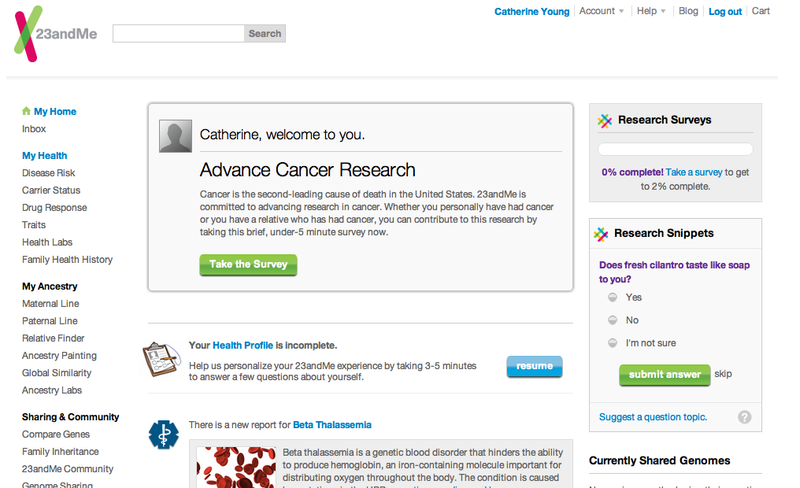 The homepage of your 23andMe profile shows updates to research results. On the left is the menu where you can check out your health and ancestry profiles. 1. I could die from a heart attack. Bummer. Of all the increased disease risks, “atrial fibrillation” topped the chart. This wasn’t much of a surprise. Once or twice a year I end up with an irregular heartbeat; my heart beats harder than normal for several minutes. I would stop and breathe slowly, and my heart beat would eventually normalize. My ECG has always been ok.
2. I have decreased risks of Type 2 diabetes, breast cancer and Parkinson’s disease. Oh happy day. 3. Clicking on “Relative Finder,” I see that I have potential distant cousins who also used the service and whom I can contact. The likelihood of me sending them a message is close to null. I think I would rather reach out to another human being because of similar interests instead of genes. It’s fun to know that I have distant relatives from all over the world, though. 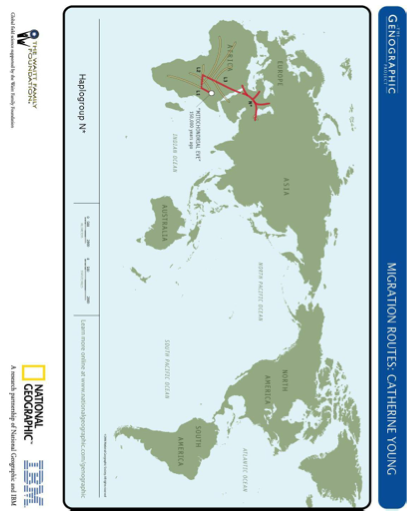 Among the results you get from The Genographic Project is a map showing the migratory pattern of your ancestors’ DNA. There are similarities between my results from The Genographic Project and my ancestry results for 23andMe, which made me more confident in their results. Highlights of my ancestral journey include (starting from Africa, where we all came from) countries in the Middle East, and then Asia. I would love to do a project where I can travel through all these countries with this in mind. Note that for both services, I would get more information if I compared my results with those of a male relative, as I, being female, do not have a Y chromosome. Do I recommend getting your DNA tested? Of course! I think human beings will always be interested in different facets of their identities. Unlike other, dubious diagnostics such as personality tests, horoscopes, etc., this gives you insight into your actual biological past (and present) and can allow you to make important decisions, especially health-wise, about your future. Will it affect me significantly? Not really. It was interesting to see where my ancestors came from, but in the end, I’m more interested in where I have been myself. My “cultural DNA”—the languages I speak, the places I live in, the habits I acquire, the people I call my friends—will likely make more of an impact on me. As for health, I think I already lead a pretty healthy lifestyle, but it’s good to know what I’m at risk for and what I’m not. At the end of the day, everyone dies. Hey Catherine! Just had a quick question. I’m from Manila as well and wanted to order two 23andMe DNA testing kits for my mom and dad for xmas. I noticed that the Philippines isn’t listed on the countries they ship to though. Just wondering if you had a workaround for this. Any input would be greatly appreciated. Cheers! For Manila, I know some people who have shipped their US-based orders (usually Amazon) to a Johnny Air Cargo address in the US. Then you pay to have Johnny Air ship those to the Philippines. Yes, I’m definitely enlightened! Appreciate the reply and the wealth of information. Think I’m going to wait until I’m in the US again. Thanks again!